Have you ever pulled something out of the oven and felt like a rock star? Felt giddy and awed at the first bite? Been so incredibly proud of a recipe you were inexplicably able to complete that you thought about framing the resulting photos for your desk at work? Okay, okay, maybe that’s a little much. But all silliness aside, there are turning points in my life as a baker where I feel like I “level up,” or gain a skill or technique that previously seemed too daunting for me to contemplate. This past Daring Bakers challenge was one of those turning points. New baking supplies for the challenge. 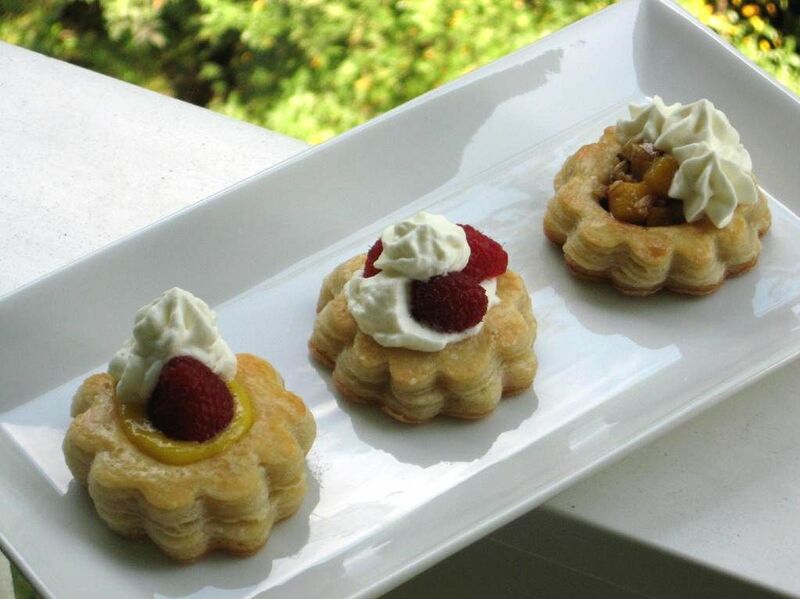 Vol-au vents are simply cups of puff pastry stuffed with delicious savory or sweet fillings. That part sounds easy. But homemade puff pastry? I have to admit, I was very nervous. The recipe looked especially daunting considering my love-hate relationship with my rolling pin. I think we’ve smoothed things out, but every now and then I still feel like giving him a good whomp against the counter to adjust his attitude. And even apart from rolling pin troubles, puff pastry is just a fickle, time consuming creation. It’s made by enveloping an entire pound of butter (Heyyy, Paula Deen!) in the dough (called a détrempe). Once the butter is wrapped up like a present, you make a series of six “turns” (tri-folds) in the dough, rolling it out between each (and refrigerating often to maintain workability). This website has a useful pictorial of the turning process, but I bet you’d love to see Julia Child and Michel Richard making it in real-time, wouldn’t you? Your wish is my command! Here’s the fun part: once you have all those lovely layers of butter and dough in the oven, the water content of the butter turns into steam, inflating your pastry. 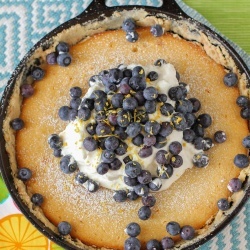 If all goes well, you end up with a fluffy, buttery bit of heaven. After watching the video above several times over, I dragged my load of doubts and worries into the kitchen and set to work with a furrowed brow. My dough seemed too sticky, my butter pounding scared little Byrd to death, and my envelope kept threatening to break and expose my butter. Nevertheless, I trudged on, hoping that somehow, my little pastries would puff their hearts out in the oven. And guess what? It worked! It worked! It worked! It’s unfortunate (or maybe not, since Mike’s eardrums are probably sore) that you couldn’t hear me shouting those two little words as I leapt around my apartment after taking these out of the oven. It was like magic! Little disks of dough turning into lovely, sophisticated pastries via unseen processes within their layers. And not only were the pastries puffy, they were out of this world delicious. I burned each one of my little fingertips to bits (not to mention my tongue) eating them straight out of the oven. Mike liked them too! Byrd was indifferent. 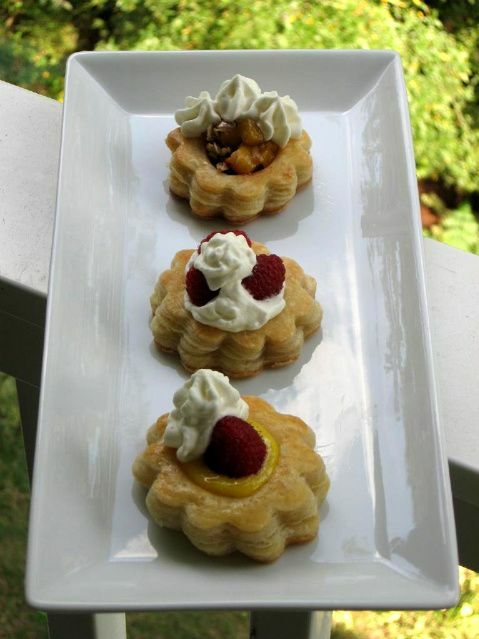 I chose to stuff my vol-au-vents with both savory and sweet fillings. 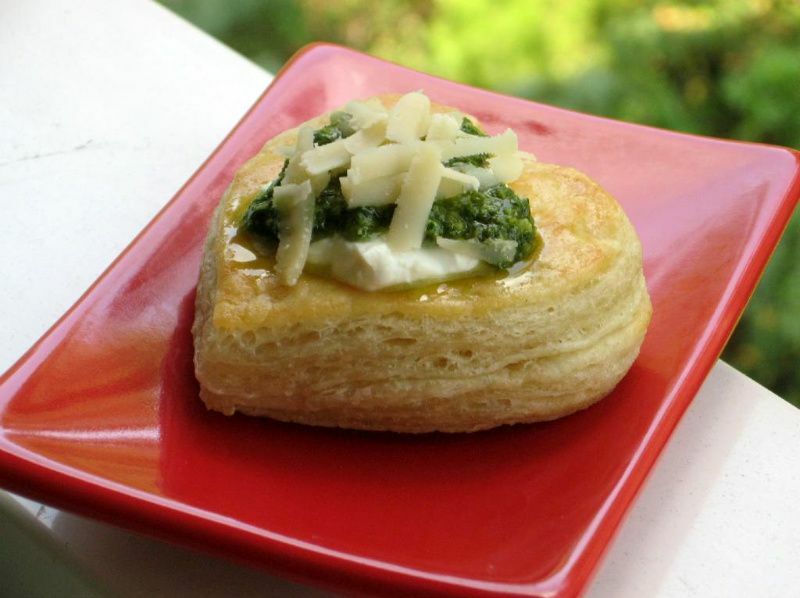 My savory vol-au-vent was filled with smooth goat cheese mousse with a drizzle of fresh, homemade pesto on top. The pesto was gorgeous — made with toasted pine nuts, extra virgin olive oil, and fresh basil (including some huge sprigs from the garden beside my classroom — did I mention that I love my school?) The tangy goat cheese and rich pesto were such a delicious combination. To make the mousse, process the goat cheese in a clean food processor until smooth. Add the whipped cream and blend just until incorporated. 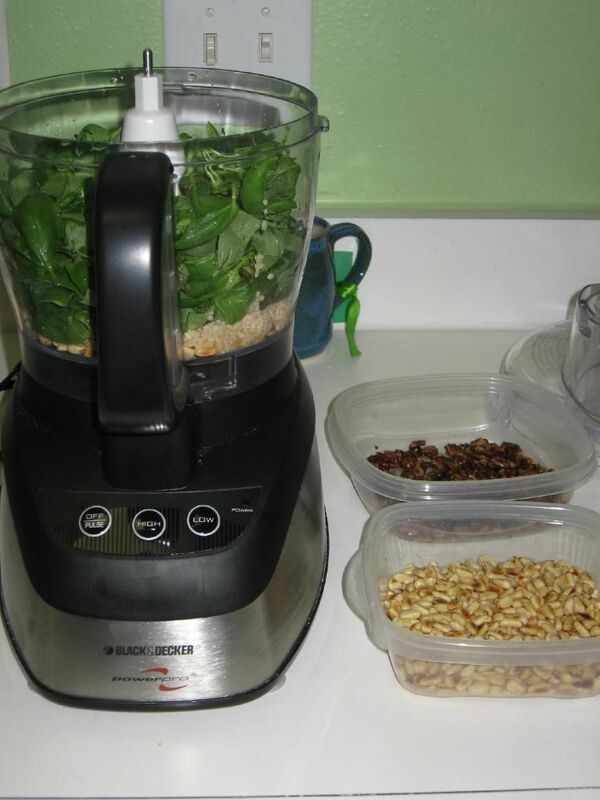 To make the pesto, combine the basil and pine nuts in a food processor. Pulse a few times. Add the garlic, pulse a few times more. Slowly add the olive oil in a constant stream while the food processor is on low (if storing, reserve half the oil — see note below). Stop to scrape down the sides of the food processor with a rubber spatula. Add the grated cheese and pulse again until blended. Add a pinch of salt and freshly ground black pepper to taste. Note: If storing and not using immediately, reserve half the oil. Place pesto in airtight container and drizzle reserved oil over top. Freeze or refrigerate. My dessert plate was designed as a walk through the seasons. Spring was represented by Smitten Kitchen’s tangy mango curd, a sweet raspberry, and a dollop of homemade whipped cream. Summer was simple: homemade whipped cream and berries. Finally, autumn was one of my favorites (in fact, you’ve seen it a few times here recently! ): baked peach crisp. I baked some peaches, brown sugar, white sugar, oats, and toasted pecans in a dish before spooning the hot mixture into my puff pastry and (you know what’s coming, right?) topped it with a dollop of whipped cream! Next time I think I’ll add the toasted pecans over top of the peach mixture at the end. 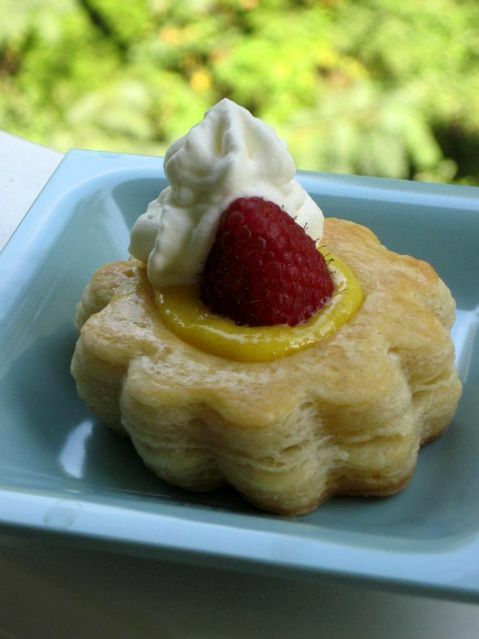 All of these dessert vol-au-vents were incredible in their buttery pastry cups, but our favorite by far was the Mango Curd Raspberry Vol-au-vent! Puree mango, sugar, lime juice and salt in processor, scraping down sides of work bowl occasionally. Add yolks; puree 15 seconds longer. Strain through sieve set over large metal bowl, pressing on solids with back of spatula to release as much puree as possible. Discard solids in sieve. Set metal bowl over saucepan of simmering water (do not allow bottom of bowl to touch water); whisk puree until thickened and thermometer registers 170°F., about 10 minutes. Remove from over water. Whisk in butter 1 piece at a time. Cover (place plastic wrap on surface of curd to prevent a skin from forming) and refrigerate overnight. Can freeze for up to 2 months. I’m grateful for the Daring Bakers for many reasons: the exciting recipes shared, the fantastic friendships made, the gorgeous blogs to visit. For this challenge, though, I especially want to thank Steph and the Daring Bakers for a huge confidence boost! 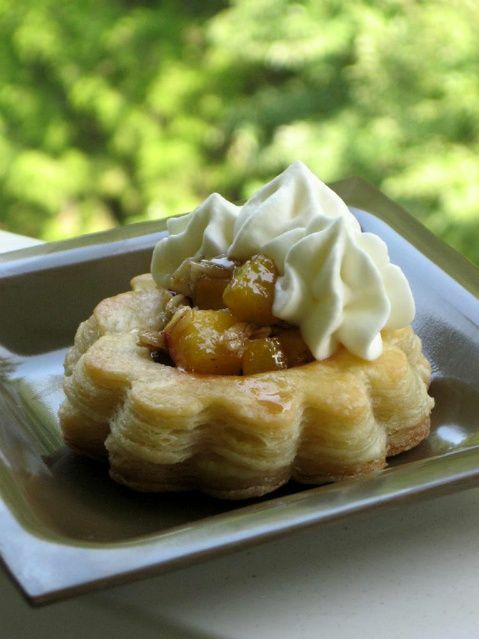 I hope you’ll decide to give puff pastry a try. It’s a manageable beast, and the resulting dough freezes well to use for months to come. Even besides those practicalities, though, it feels like such a satisfying kitchen accomplishment! While this is not included in the original recipe we are using (and I did not do this in my own trials), many puff pastry recipes use a teaspoon or two of white vinegar or lemon juice, added to the ice water, in the détrempe dough. This adds acidity, which relaxes the gluten in the dough by breaking down the proteins, making rolling easier. You are welcome to try this if you wish. Not to sound contradictory, but if you chill your paton longer than the recommended time between turns, the butter can firm up too much. If this seems to be the case, I advise letting it sit at room temperature for 5-10 minutes to give it a chance to soften before proceeding to roll. You don’t want the hard butter to separate into chuncks or break through the dough…you want it to roll evenly, in a continuous layer. Roll the puff pastry gently but firmly, and don’t roll your pin over the edges, which will prevent them from rising properly. Don’t roll your puff thinner than about about 1/8 to 1/4-inch (3-6 mm) thick, or you will not get the rise you are looking for. Vol-au-vents ready to go into the oven, and then baking under a silicon mat. 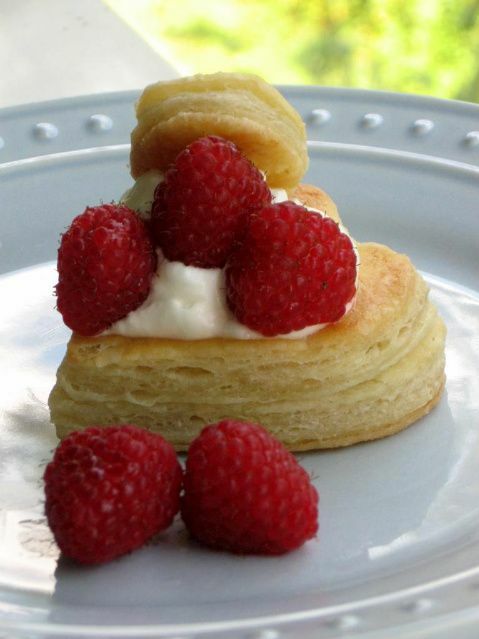 Don’t forget to cruise the Daring Bakers blogroll to see all of the creative vol-au-vents fillings other chefs chose. Now I want to hear from you: what was your proudest culinary achievement? Thanks Mom! I wouldn’t have if it weren’t for you! Ummm… how about sewing next? I love the combinations you produced! I think I would have to go for the goats cheese and pesto option, unusual for me as I have a terrible sweet tooth… Well done (I chickened out this month!)! Love your beautiful hearts and flowers! They all sound like great flavor combinations! Thanks Barbara! My circle cookie cutters just weren’t the right size, but it worked out for the best! Great job on your challenge and it must have been really delicious to burn all your fingers. Love your filing combinations. It was the best finger burning I’ve ever experienced 😀 Thanks, Jo! Oh great job! And I totally agree with your first paragraph! Your puff pastry looks fantastic, and your fillings sound wonderful! Delightful! I can’t wait to try a savory pastry as well. Ooooh, delish! I love the idea of mango curd–I’ve never made it before but it sounds totally delicious! Yum! Thanks, Sara! It is REEEEALLY yummy! WOW!!! You went all-out! I love all the beautiful shapes and variety of fillings! Bravo!!! Gorgeous photos! I love your shapes. 🙂 Great job on this month’s challenge. Your enthusiasm is infectious! So glad that you enjoyed this challenge, and that you overcame your fears of homemade puff pastry. They do look gorgeous! I felt the same way — about leveling up. This probably was my proudest moment so far. I was so afraid that my puff pastry just wouldn’t work. I ran around shouting, “It puffed! It puffed!” Ha ha. Yours are fabulous. I love your fillings… that goat cheese mousse sounds delightful, especially with pesto. And I’m a big fan of all of those dessert ones! Love your beautiful hearts and flowers! Gorgeous photos! yummmy fillings! I giggled all the way thru your post. Yes, I too felt like a rock star! Very appropiate that your rolling pin is male!! Your vol au vents are fantastic and fillings delish! Thank you, Marcellina!! Oh, did you catch the gender I assigned my rolling pin?! 😀 Must have been a subconscious slip! You are too ambitious! Great job, they all look so yummy. wow! mango curd is a dream. i love all these varieties – a brilliant job on this challenge! Thank you, Meeta! We love that Smitten Kitchen mango curd recipe! Mmm! Haha I felt EXACTLY the same way when I saw my puffs were rising! Hmm proudest culinary moment…Well, I was stoked when I made swiss meringue buttercream, because my husband made it, and then when I tried it for the first time I completely screwed it up. I felt “behind” until I tried again and got it right! Beautiful! I love the fillings you made – simply delicious =D. Wonderful job! they puffed up so nicely! 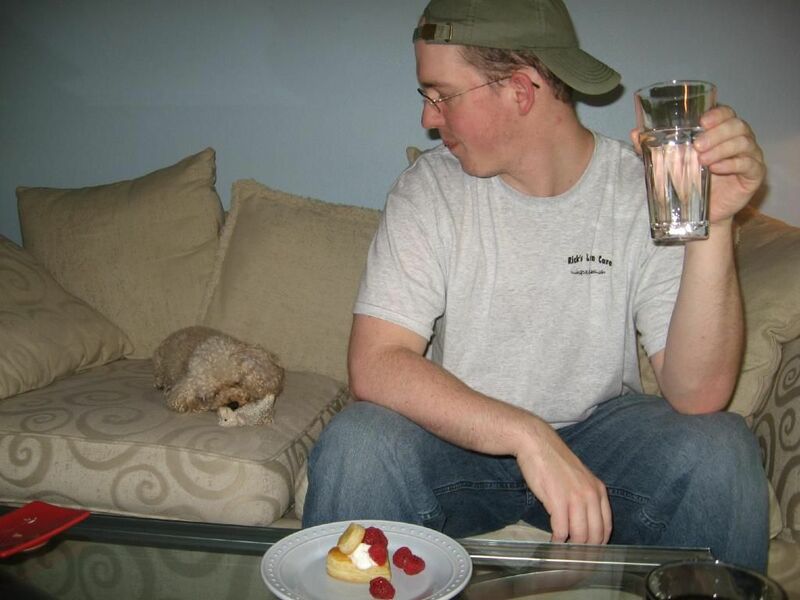 your dog is so cute! Wow, you became a Puff Pastry Pro! Well done. Aww, thank you so much Lorraine!! 🙂 Wonder if Kanye will show up at my acceptance speech? I have them so often since joining the DBs! Such a wonderful group 🙂 Thanks, Shaz! These look gorgeous. And mango curd has to be my favourite! Thanks, Aparna! We adore mango curd. Mmmm! I V-a-Vs looks yummi-licious! I love the fun shapes you have…and ohhhh the mango curd!!! I’ve gotta try that someday ~ huge fan of mango. Ciao ! I was very excited too, it was a scry and fun challenge ! I love the assortment of your fillings !! I can’t believe I started watching that Julia Child video and I forgot to leave a comment, here! Really, that was a great finding! And as good as that movie is your vol au vent! Really, they are amazing! All nice and puffed up! Congratulations! Thanks, Steph! It was such a great challenge! Love all the different shapes and fillings you did for the challenge and your dog, just too cute!! Popped in to say hello! Those look wonderful. 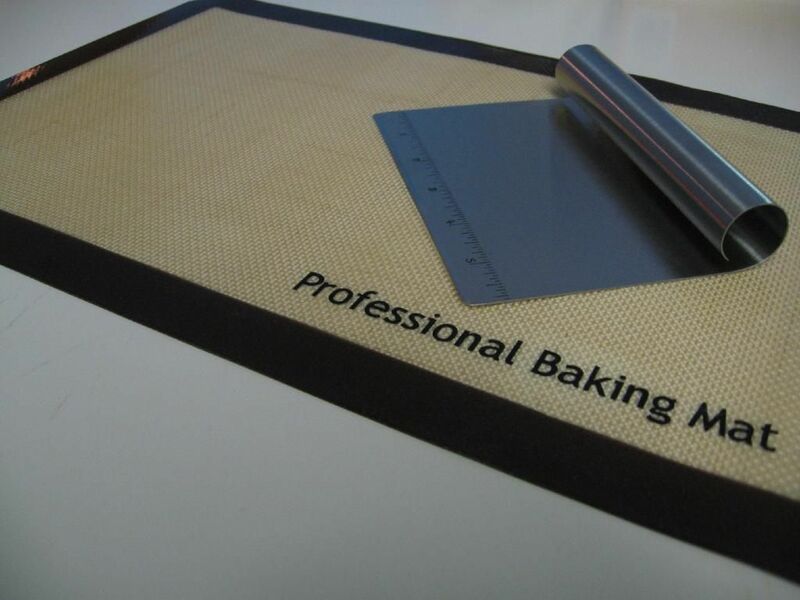 I need to get another silicone baking mat–my husband destroyed mine by mistake! Thanks, Blond Duck! 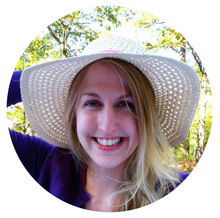 Love your fun blog! Your vol au vents turned out so lovely! And, the fillings sound delicious! found your blog, ’cause you left a comment on my blog :). Nice bl0g you have. Like your writing and how you blog is structured (like those “frames” you have ’round your recipes). Well done on the challenge! Especially the goats cheese and pesto filled vol au vents look delicious… getting hungry. Julie, wow, what a beautiful job! It was fun reading how you scremed out when it worked. Been there, and I think I’ve broken a few ear drums..lol I love the goat cheese with pesto, and in fact, made a savory vols au vent myself with goat chese and pesto, but pistachio pesto with arugula in lieu of basil. Also adore the raspberries and cream..simple and perfect. Well done all around! Thank you, Lisa! MMMmmm that pistachio arugula pesto sounds AMAZING. Definitely need to try that! Arugula is one of my favorite flavors. Super cute shapes and what a variety of fillings! I’m drooling over the goat cheese basil combo. It would work just fine for breakfast for me about now! Everything looks great! 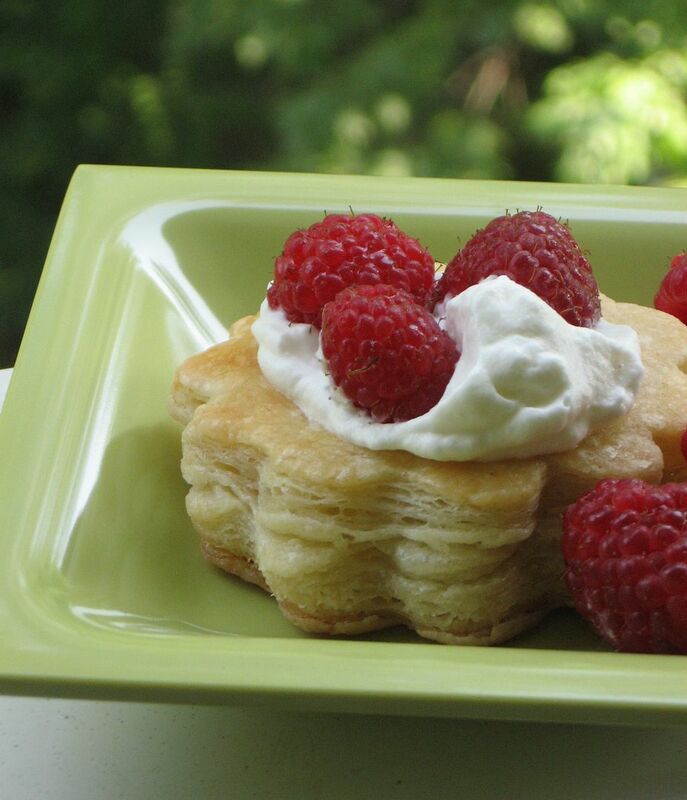 I love puff pastry I alos love your blog! Thanks, Baking Monster! You have some delicious goodies on your blog! Pumpkin Cream Cheese Muffins?! Mmmm!! Perfection! Love all of them! Pesto and goat cheese, a classic with a hint of surprise. Fabulous job! Hi there. 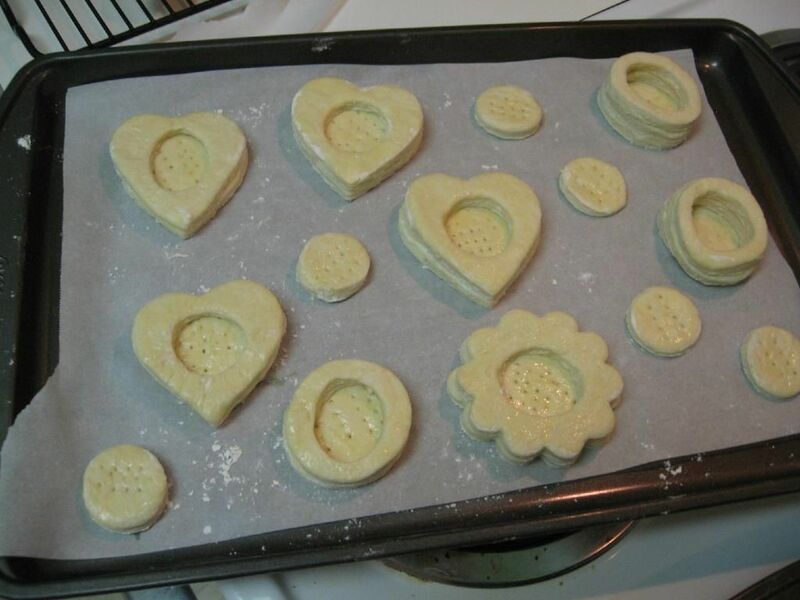 I am doing some puffed pastry with vegetable cheese strudel today and was looking at your website and noticed that you had poked holes in your shapes prior to cooking. Is there a particular reason you did this – and if so – is it necessary as I have never done it in the past? Do you mean the holes poked with the fork prior to baking? That’s called docking, and you do it to let some of the steam escape. 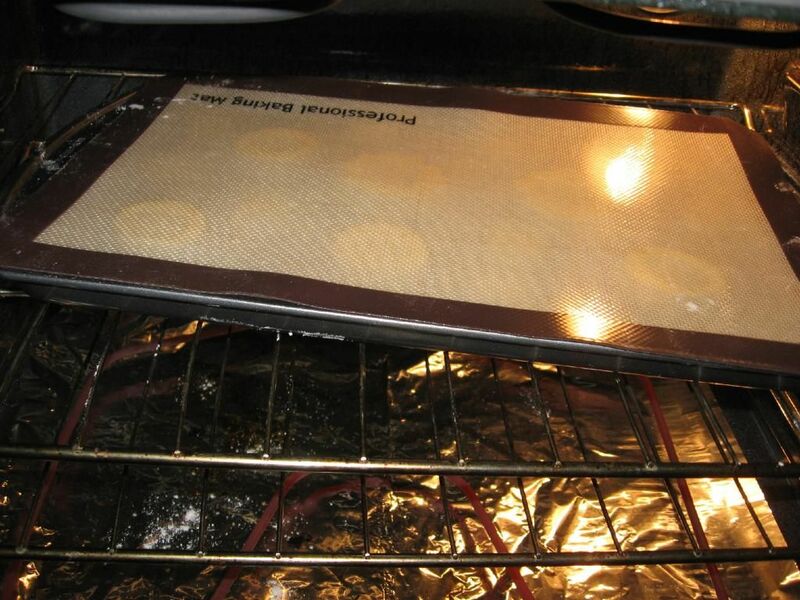 It’s supposed to prevent the steam from over-puffing and deforming pastries. It keeps the base relatively even. I also dock pie crusts, etc., before baking, but some chefs don’t bother. Hope that helps! Good luck with your strudel — sounds delicious! If only I had a quarter for every time I came here! Great post. Those pesto-goat cheese things look like they should be illegal. Wow. I don’t have a food processor, but I’m sure there is a more old-fashioned way to make puff pastry. It’s so beautiful dear! Thank you so much for sharing .god bless you. Thank you, Rosalind! God bless you, too.